We certainly can't complain about our "Chamber of Commerce" weather in Stuart. It is glorious! If you aren't here or traveling to the area soon, you don't know what you are missing. We can not believe some of our Snow Birds are all ready heading home; safe travels. We hope you won't be sorry....afterall it is snowing flakes up north instead of rays of sunshine. To continue the "Beach Walk" journey we have added a few classes to our March schedule; Wednesdays, the 9th and the 16th 12:30 - 4 and Saturday the 12th 12:30 - 4. We hope to show you all the ins and outs of completion, including the Angelina Fibers and mitered borders. Two of the 9 blocks in the quilt. Remember you can do the individual pieces of quilt, if the whole quilt is not to your liking or time frame. But if you are interested in a more whimscal sea project, this panel is for you. We have in a few of the matching fabrics as well. Wednesday, Feb 23rd, we are offering the Woven Table Runner with Kim Ewing. 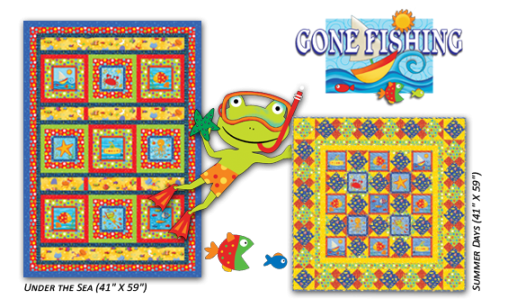 The class and pattern are $35 and does require pre class work to complete the table runner in class. Stop by and get your pre-class instrucions. Thursday and Friday are UFO days. Our classroom is open for you to sew, quilt or baste for just $10, 10am to 3:30pm. We have lots of room for you and your friends. Come and have fun at the Patch working on a project. Have we told you some of our newest fabrics are the Christmas 2011 lines. Yipes!! But the holidays continue to approach. But first, the spring colors are in bloom for your favorite project. Then comes along the red, white and blue for our summer festivities. OK, I won't rush the rest. We want to remind everyone of you - this Saturday, February 26th, we are giving away FIVE quilt/quilt collections to continue the 5th anniversary celebration. SAMPLE SPREE (the sale of many of our collective samples) will begin at 1pm in our classroom. No early shoppers allowed!! No exceptions!! At 3pm, the quilt give away begins. If you are present and we call your name YOU chose the quilt. If you are not here we pick it and keep it aside for you to pick up. We are sorry if it needs to be shipped, you will have to pay for the shipping costs. As a tribute to out "northern" friends and family: BLUE is the sale of this week. "No cold BLUE noses here!" The Blue fabric is 25% off 1 yard minimum cuts. This sale does not include Batiks, the Beach Walk collection or any new holiday fabrics. No JaM Clubhouse Certificates are redeemable on sale merchandise. Sale dates- today through Monday, Feb 28th. A reminder all JaM Clubhouse Gift Certificates are only valid until close of business on February 28th, 2011. There are no exceptions. So please come in and use them. Final day is February 28th, 2011.